You are here: Home / Publication / At least 12 Color Metamerism types! Two situations and two colors. First, the colors look identical and in the second situation they differ. Light source metamerism is the most notorious, but there is a wider range of circumstances in which you can be (un-) pleasantly surprised. Especially professionals in businesses requiring perfect matches (design, car refinishing, fashion and cosmetics) or in top quality color control, should be aware of the different types of metameric risks. For everyone else this article is meant to offer a better understanding and fun about the miraculous beauty of the colors that surround us. This is the well-known type of metamerism; two colors appearing similar under one light source and appearing different under another light source. ng difference soon after you parked your car in full day light. It is not hard to find the theoretical explanation on this tricky subject, but seeing a good example can be shocking! This effect can also be demonstrated on textiles, paper, cosmetics and bank notes. In normal day light you will see no notable effect, whereas if you look under an UV emitting light source some parts will light up due to the use of optical brighteners. Also remarkable; people are often the weakest link in evaluating a color difference. Inter-observer variability is really fascinating subject! Just take the three types of cones in the retina of our eyes. Who would ever considered two people with “normal” trichromatic vision could differ in totally different ratio’s between the red and green sensitive cones (79:20 versus 51: 44)? Apart from physical differences and (dis-)abilities due to age, eye sight or color blindness, people can also be influenced mentally. Just mind-set, mood ,stress, tiredness or using drugs or medicines can affect their decision on whether two objects appear to be similar or not. People can also be trained to evaluate colors in a quality control setting and develop a higher sensitivity towards visual differences. Professionals in visual quality control are often taught to describe the difference they perceive in hue, lightness and saturation and somehow this regular stimulance makes them super critical which may both work positive as negative in applying their job. The color depends often on the angle you look at it. In nature (oyster shells, rainbows, soap bubbles), textiles, effect color paints and printed materials, there are many examples of colors that change dramatically when changing the angle of incident light or viewing (observation). Matching those colors is a huge challenge and in lots of cases the agreement between original and imitation is “ok” in one angle and fails in others. This type is well known in the paint industry and dentists. There is a lot of time saving possible when correcting the color while the paint is still wet. But a wet paint can have a different color when it has dried. Same counts even more for teeth in which not only color and gloss are important but also translucency. Or did you ever clean an old school black board with water or looked how water drops colored a piece of textile or paper? Most of the time this effect is reversible. Gloss is actually a special kind of geometric and related to wet-dry metamerism. A high gloss color can match with a matt color in a certain angle between incident light, colored surface and the observer. The other angles however will mismatch in a darker-lighter difference. All cats are grey in the dark. But with a little light you will see some different colored shades. And with more light you may observe them having a variety of colors! The ability of discriminating color differences is clearly dependent on the power of light. So, with a dimmed light source one might see no color difference whereas, with the same light source at higher power a difference becomes clear. For two small sized objects, like two post stamps close to the eye, it is hard to judge whether colors are equal or different. Same is for bigger objects at a large distance. So, two small objects close by can visually match, whereas when the same colors are provided on larger samples on arm length, they might appear visually different. And when the larger samples are put on a 10 meter distance they might look similar again. This size and distance effect is an obvious result of the size of the projected image and the spatial arrangement of the cones on the retina of the eye. There is a second distance effect. When two colored objects are placed adjacent – no space left in between – the eye is highly sensitive to small color differences. This sensitivity drops immediately when there is room between the objects and even stronger when the space between the objects has a contrast color compared to the objects. Even when we focus it is impossible to lock out other colors in our field of sight. Humans and many animals do not look at a scene in fixed steadiness; instead, the eyes move around, locating interesting parts of the scene and building up a mental, three-dimensional ‘map’ corresponding to the scene. These so called “saccadic movements” are the reason for a range of weird optical illusions. In the displayed picture of the chess board, one can find field A and B to be equal by placing a mask over the scene which blocks the fields around. Try it! 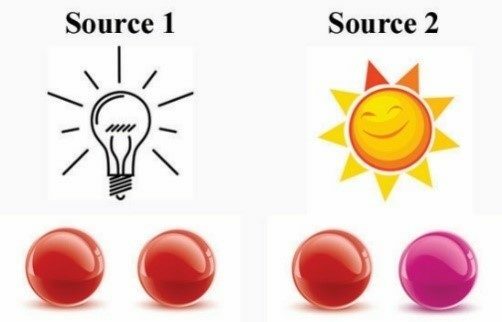 When people are asked to decide whether a pair of color samples match or not, their decision is dependent on the time they get to consider their choice. In a fraction of seconds they will be less critical as when getting a longer time interval. Somehow the eyes and brains have to adapt to a new set to evaluate. So in a short interval colors may look equal, while taking more time one can view a difference. Taking a very long time to consider a color pair may result in doubt and retinal fatigue might have an effect on the next pair of colors. This is in particular important in situations that people have to evaluate large numbers of colors in a short time and also when people have to visually check colors that move like on an assembly line or conveyor system (like in coil coatings). Most colors change in time. Some in minutes, others in hours, years or ages. So, two colors might match on one moment and mismatch later (or vice versa). The short time color changes often happen directly after production of a colored product. Binders may yellow, pigments need to settle and inks may have a delayed absorption. Most of these effects slow down in time untill it reaches asymptotically a final stage. The other effect relates more to the end of the product life cycle, like fading and degradation of color. These effects appear to show an increasing color difference gap in time. This is a rather obscure type. There are not many situations in which colors change due to a variable humidity, but there are a number of chemical substances like Cobalt or Copper Chloride that do. Cobalt Chloride remains vivid blue in a perfect dry water-free condition, turns purple when the humidity rises and becomes pink when relative humidity approaches 100%. On the internet there are several moisture detectors providing a colored indication of a certain humidity level. Thermochromism is the property of substances changing color due to a change in temperature. There are a number of spectacular examples of dyes, inks, paints, liquid cristals and polymers which can flip from one side of the color gamut to the other in just a couple of degrees Celsius. But there is also a more subtle form of color change due to temperature. Many inorganic substances show a reversible color shift when temperature rises or declines which can lead to perceptual color differences within a range of 5 degrees Celsius. This is the main reason why quality control of color should always be done within a fixed temperature range. There might be more types and we challenge anybody to contribute to this list. We considered glasses, contact lenses or other types of filters, especially when seeing an awesome video by colleague color scientist John Seymour. It was hard for us to not offering proper explanations (we skipped most). The blog would have become a book with at least 12 chapters. Our main reason for writing this blog – next to fun – is to provide a checklist for professional color technicians or companies that aim for perfect matches or a constant colored product. Unfortunately and too many times, we encounter colored products clearly aimed at one, but showing a variety of color shades. The Success of RGB Searching Yes, they arrived: cheap affordable ways to measure color!